Mike and I made one last push on spring creek Sunday morning before saying goodbye. For once, instead of raining all day and being dry all night, it rained all night and brought the level up even more for us. 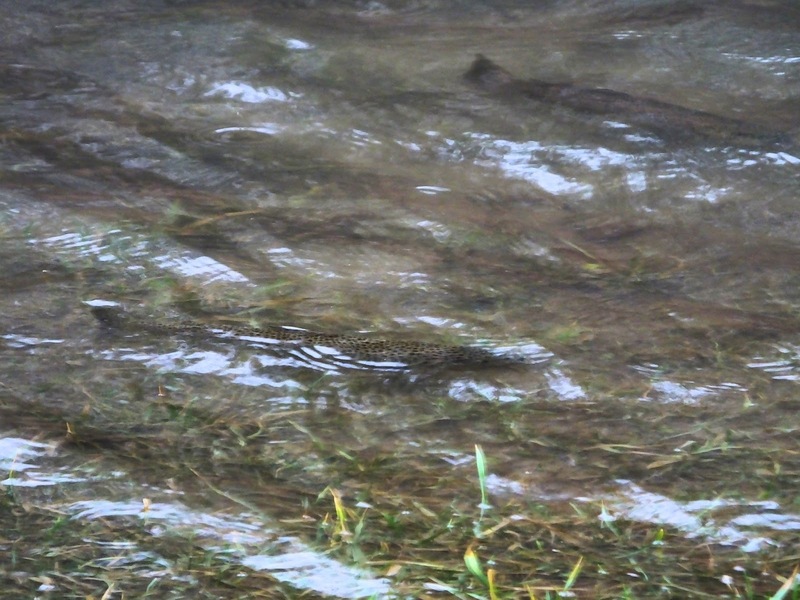 I started out of course, fishing to the trout nymphing up on the grass. 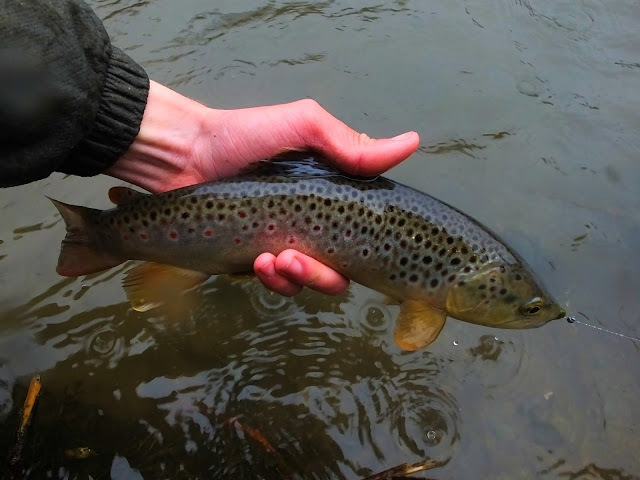 I started trying to get one on a dry fly. 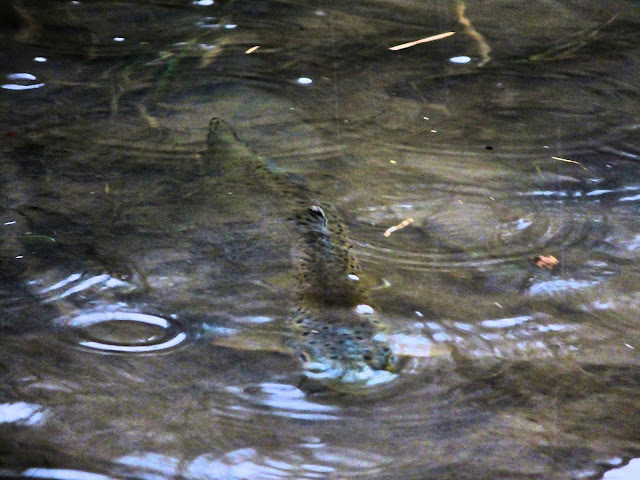 We had seen these fish and others rise during our time there and a fish in inches of water is an easy dry fly target. No dice, even though I saw a midge type rise while I was rigging up. I switched to a crane fly nymph and was immediately into a very pretty brown. In the next back eddy up, I got a second. In the third, I missed one. 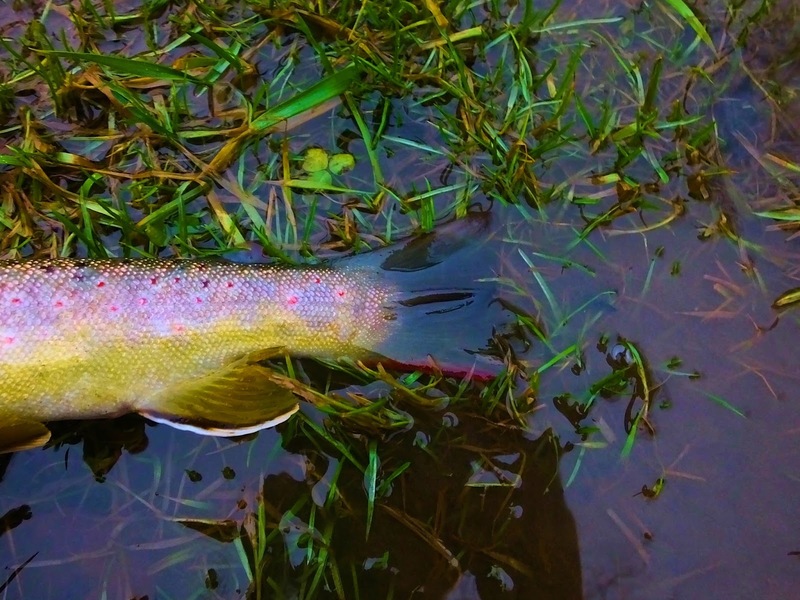 In the fourth and final I hooked and lost a some-teen inch fish that was absolutely ablaze in orange and red. A fish I really would have loved to have gotten a photo of. No enhancement. This is what it was really like. I changed to a streamer and worked down, catching one small fish and getting another that came in fouled. I don't take photos of snagged fish even if they are as nice looking as that one was! I then crossed a bridge and walked down to a place where clear water was dumping into the creek. Initially all I saw were suckers. Big ones. But after a bit of spot and stalk I found a big hatchery escapee rainbow feeding actively. I tied on a pink Frenchie, added a split shot, and started to work the fish, which was sitting in a very inconvenient spot as far as current goes. It may have taken at on point but I couldn't see my fly or feel anything so I was basing my hook set entirely on what I saw the fish do. I kept making the best drifts I could, focusing right on that rainbow's head, when I got distracted by some motion just next to the bow. There was a big brown that I hadn't even seen, white mouth open wide and head shaking angrily. Now, what I should have done was lightly lift the rod and proceed to carefully fight the fish. 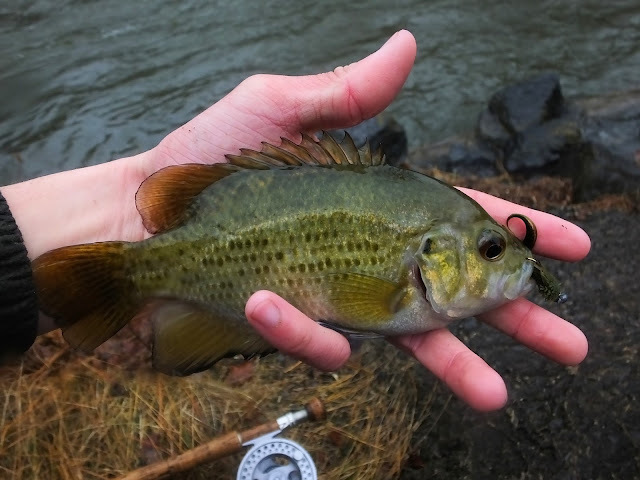 What I did was make an aggressive downstream hook set and break the fish off. That really was a good fish. Not huge, but big enough to be impressive. And it would have been a heck of a sight-nymphed trout. 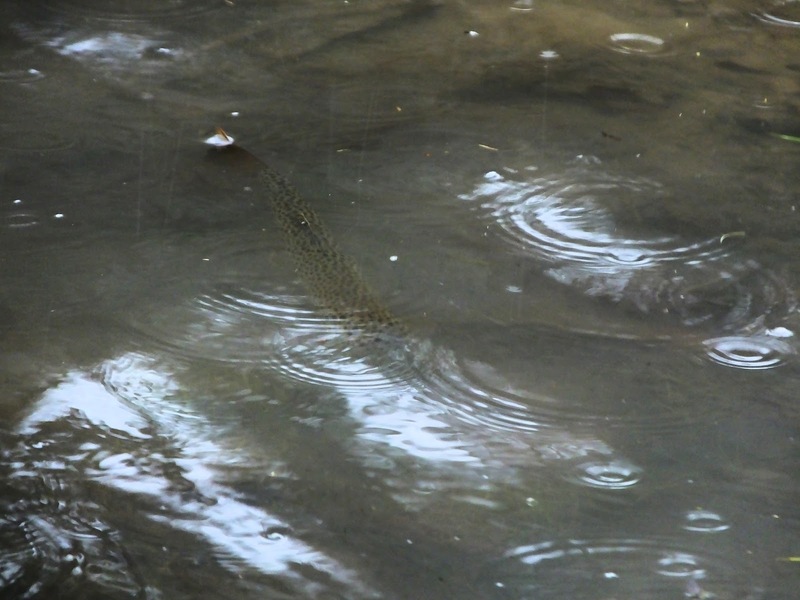 But now, what I really have is a looming image of the fish that could have been and a big reason to get myself back to Spring Creek very soon. Saturday was the last Mike and I had a significant chunk of time to devote to fishing on this trip. 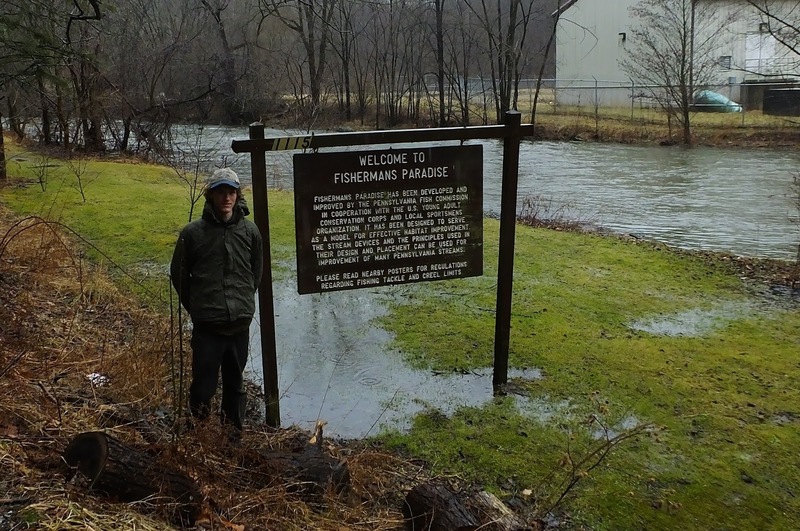 First off we checked some possible options in Bellefonte, which we didn't fish. It was pretty clear that going back to the areas we'd already fished was the best option so that's what we did. 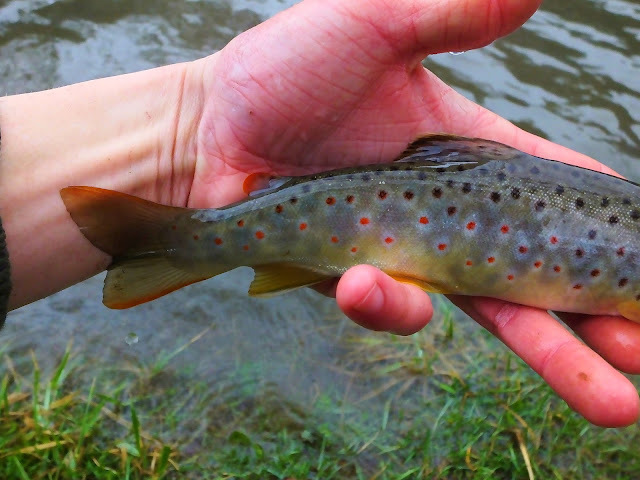 I quickly caught two of the trout tailing in the grass on a cress bug, then switched over to an olive sculpin. 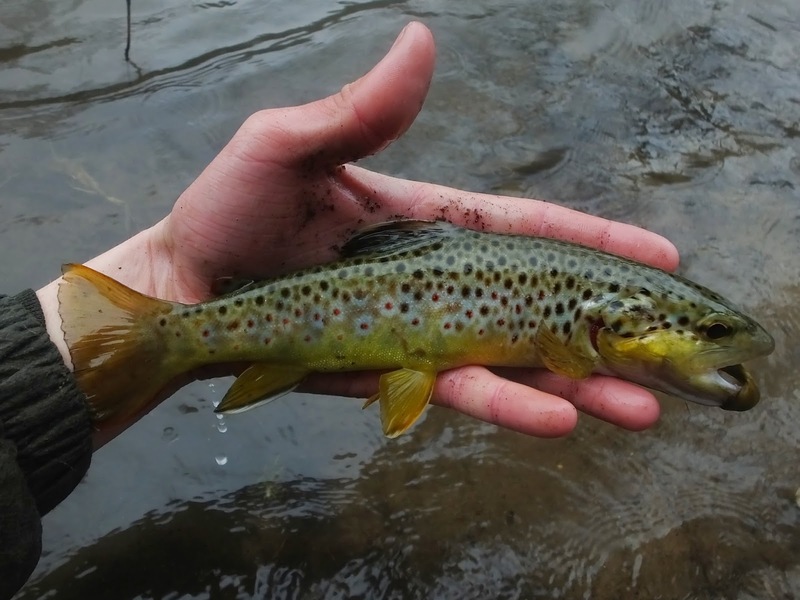 I quickly caught a third brown of about the same size on the sculpin, then missed three others. Thankfully I didn't miss the next grab. I twitched the fly as tight as I could to the bank and an unseen trout ate the fly and left a large surface boil. I lifted to set the hook and the fish, a good sized brown, cleared the water in two spectacular somersaults. Righted itself after the second and tore off dowstream. I got it into some slack water at the last moment before it cleared a logjam I wouldn't have bee able to get around. This ended up being the best fish of the trip, a very healthy and mean looking buck. A proper spring creek sculpin eater. I continued one, excited to be on a fairly fast paced streamer bite and hoping to break into the double digits. The fish below was a bit of a surprise. Mike caught two of them and I caught one and lost one. What they were doing in Spring Creek I have no clue. 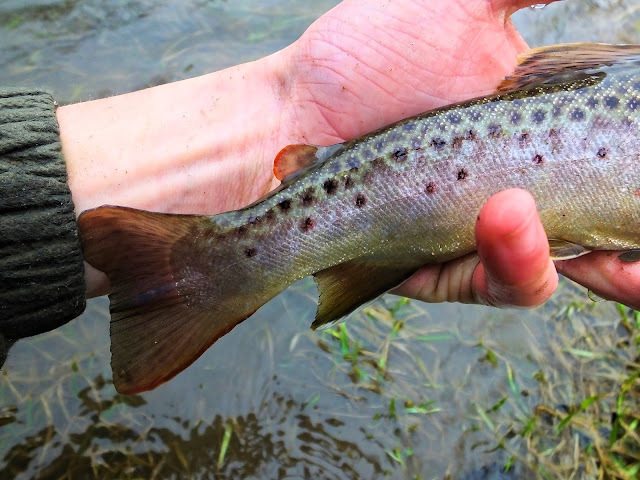 Eventually I jinxed myself by saying I wanted to get at least ten trout out loud to Mike, and after I caught my ninth one I went on a string of fish missed and hooked and lost. Never do that kind of thing folks, It can put an end to a string of good fortune! Mid afternoon the rain become steady and we called to to get some rest and clean up for the evening event, a benefit dinner for the PA Fly Fishing Museum. Joe Humphreys was the guest of honor, with his student and one of the best fly anglers in the world, George Daniel, making a speech in his behalf. Greg Hoover made a very entertaining and informative presentation on the little blue-winged olive dun hatch. 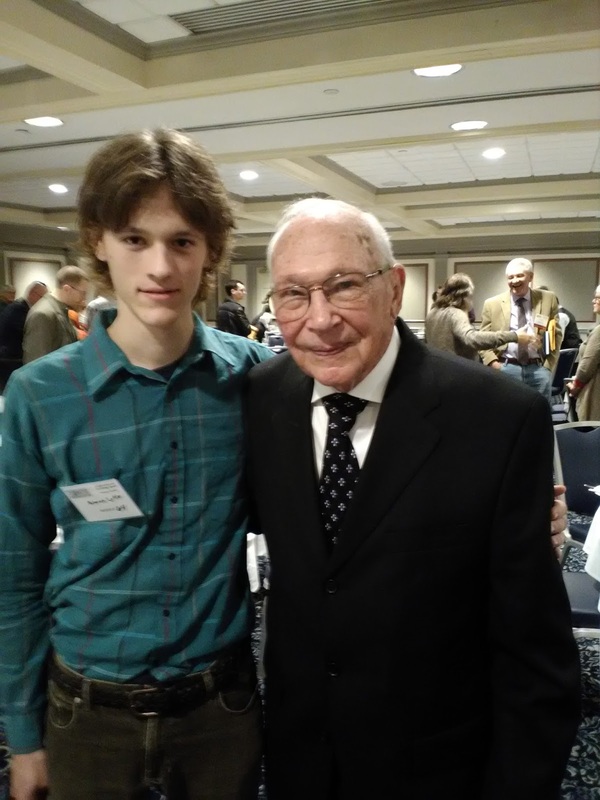 I have been to a lot of shows, been around some really influential figures in the fly fishing community, many of which I have learned a lot from and look up to. But on this night I got to meet the legend himself, an angler and teacher who I owe a huge amount of my trout fishing success to. Joe is indomitable. Mike has known Joe for years, they are close friend. Hopefully I will get to share a piece of water with him soon. Another day another spot on Spring creek. The water was just as high and just as discolored, but Mike and I didn't come to sit in a hotel room. So we fished. 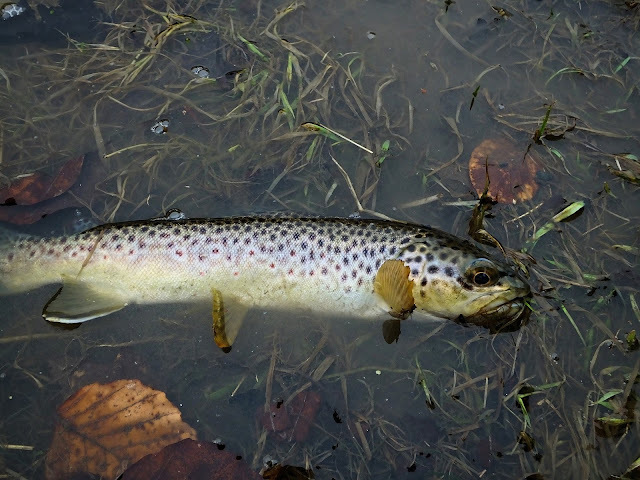 And if you know what you are doing, and we both do, you can catch trout in the worst of conditions. 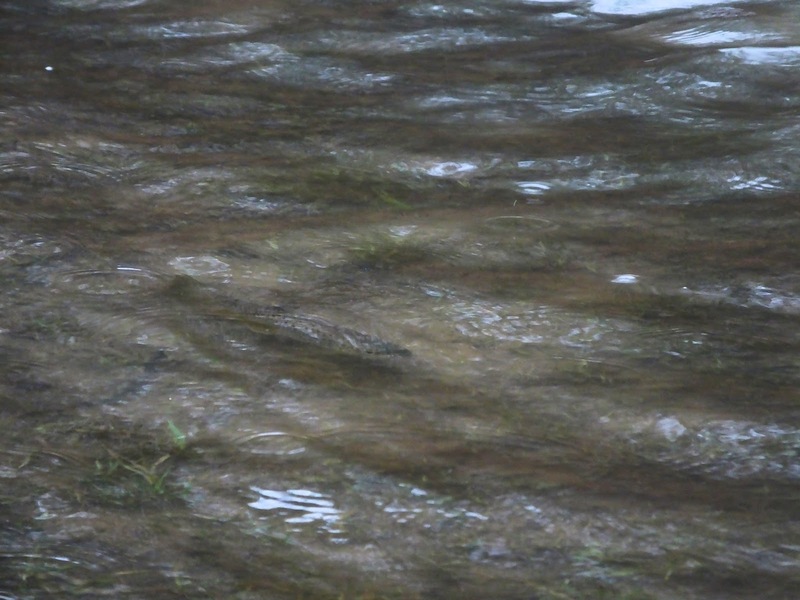 The fantastically dense trout population in Spring Creek was definitely in our favor. It didn't take long. 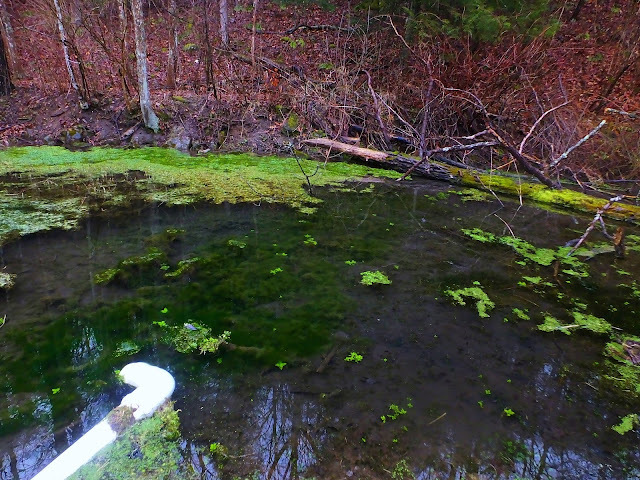 I worked a spring mouth where the water was clearer first. Out of two takes there I hooked one fish. 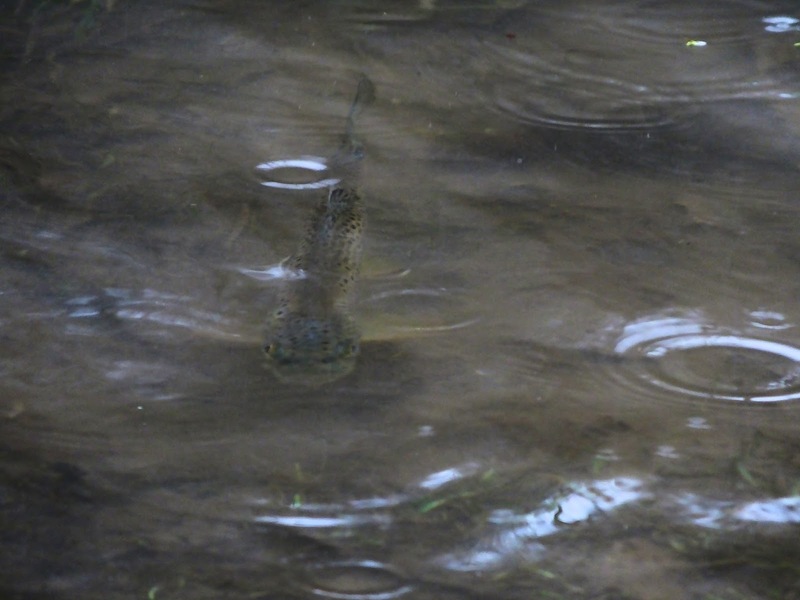 I then changed from two nymphs to a sculpin and one nymph and fished that in a soft seem behind a bridge abutment. The flies fell quickly and I felt extra weight there. I set into the snag and imediately roll cast to knock the fly free. That's when the snag, a mid teens rainbow, jumped and tossed the hook. 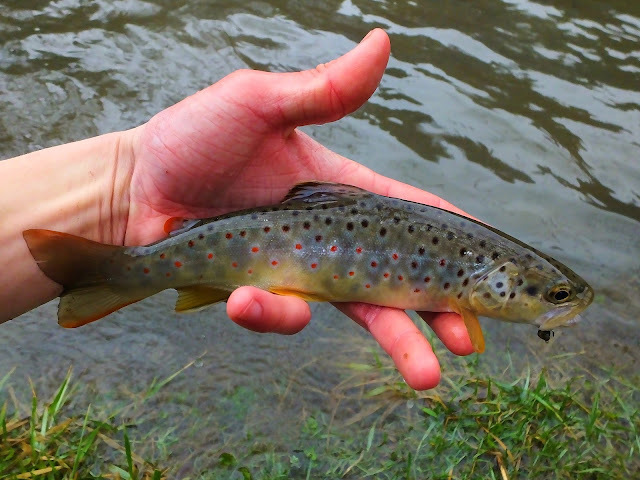 I continued downstream and missed a handful of very quick grabs on the sculpin. Eventually I got another solid hookup. 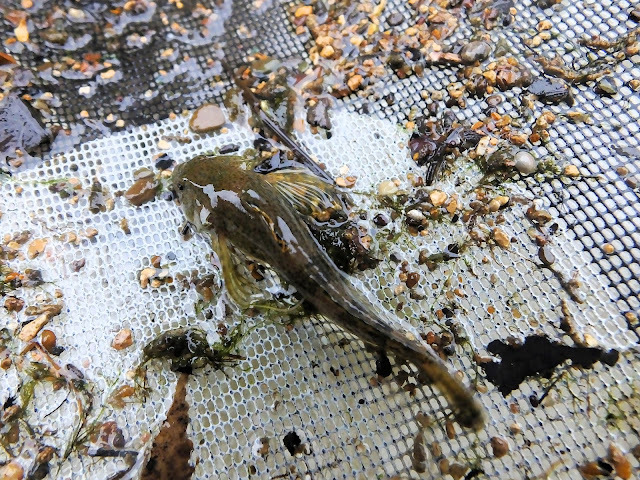 The sculpin had actually hung up and the fish hit the shrimp and hooked itself. I had to wade out to get him free from the branch. 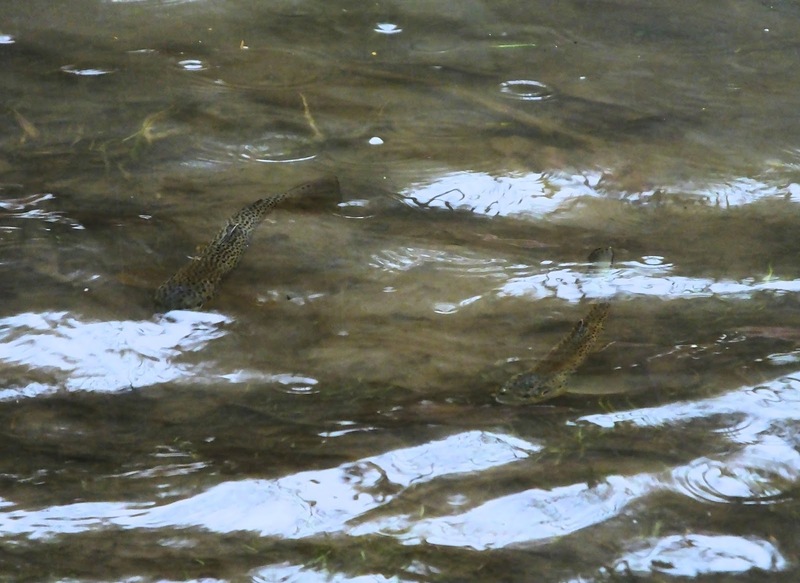 Macroinvertebrate biomass is one of the largest factors in making Spring Creek such a strong trout fishery. 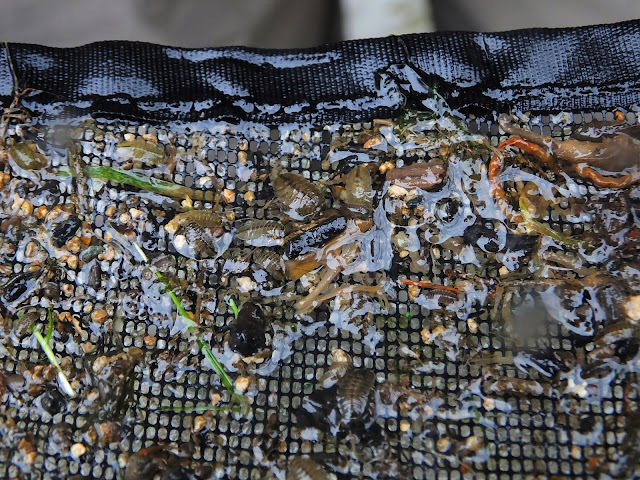 Mike was keen on showing me this by kick seining. Surprisingly, the first seine turned up a sculpin amongst all the sow bugs and baetids. There were not a whole lot of shrimp, but there were some. There were even fewer cress bugs. 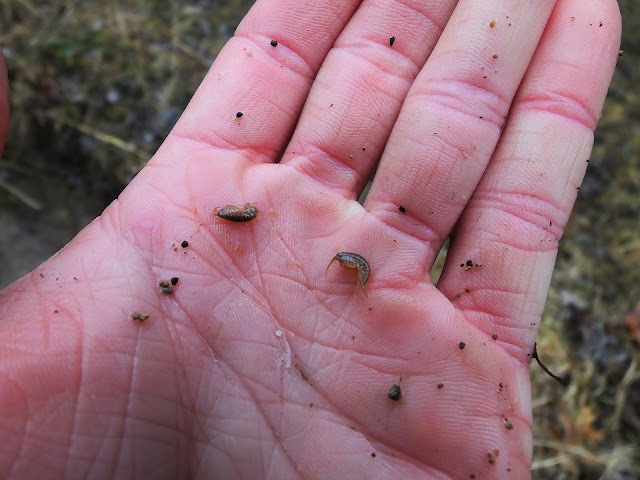 There was, however, a ton of sow bugs. We moved a couple miles downstream after that. I got one the board there pretty quickly with a nice fish on a Vladi Worm. The fish in the water. The fish out of the water. I've noticed a distinct difference in behavior, color, and strength with these brown trout. There's something special about limestone streams. 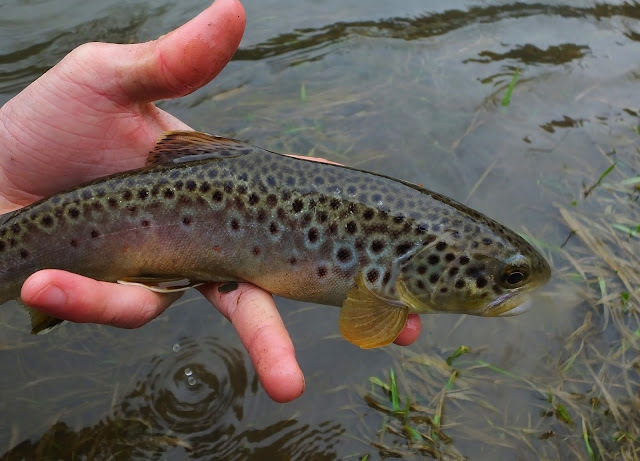 Their temperature and flow stability is fantastic and they have really spectacular biomass. In my mind brown trout were made to live in these types of streams, and even though they are not native it feels like they belong. The rest of the afternoon was frustrating. I missed a handful of fish on nymphs doing the Leisenring Lift then caught one on a black sculpin. I felt like w should have been getting far more action than we were though. 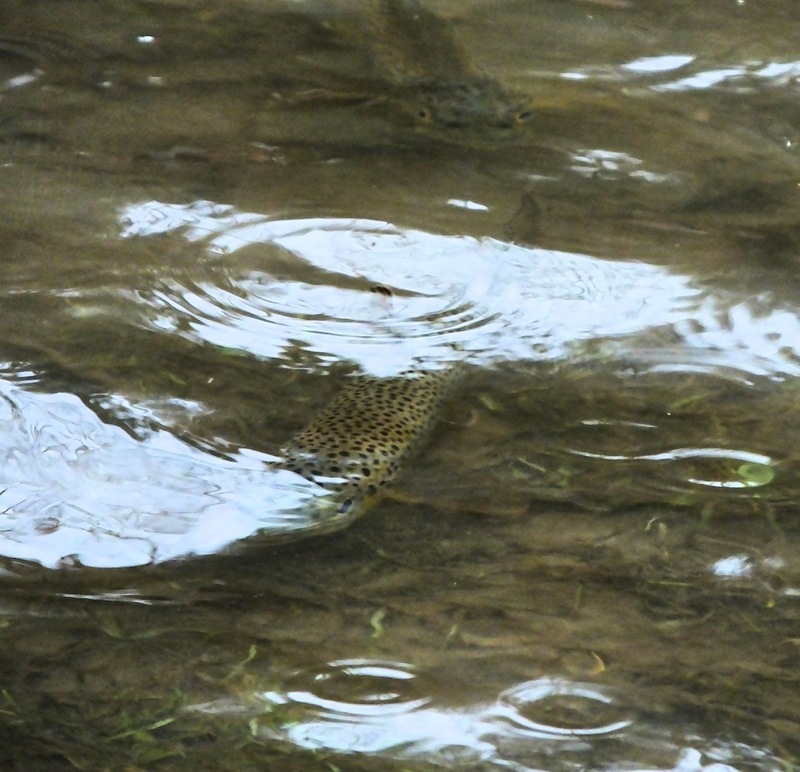 Perfect drifts with proven flies went untouched. Today, on the other hand, was a real morale booster. But you will all have to wait a day or two for that. 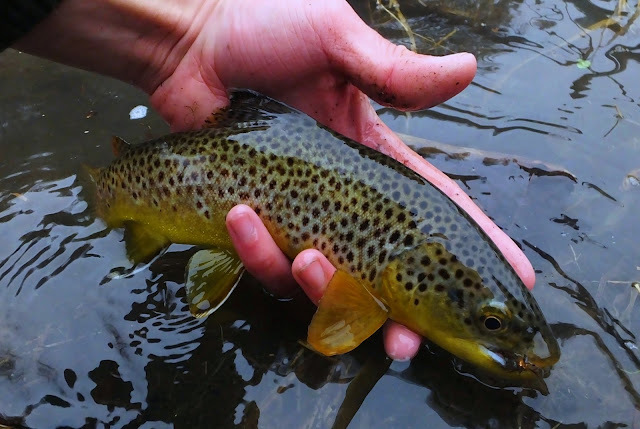 There are a handful of places that are, to trout fly fisherman, truly holy lands. 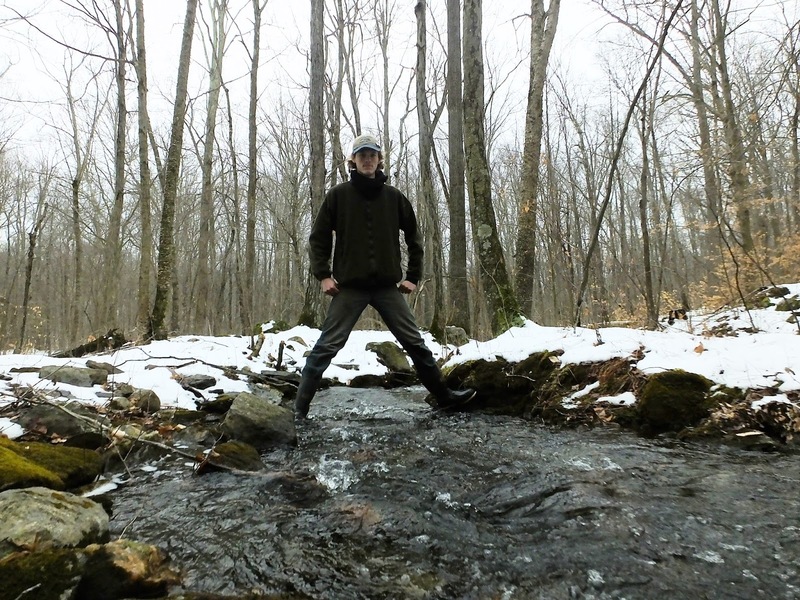 The chalk streams of England, the salmon rivers of Scotland, the freestone streams of the Catskills, the Rangeley Region in Maine. 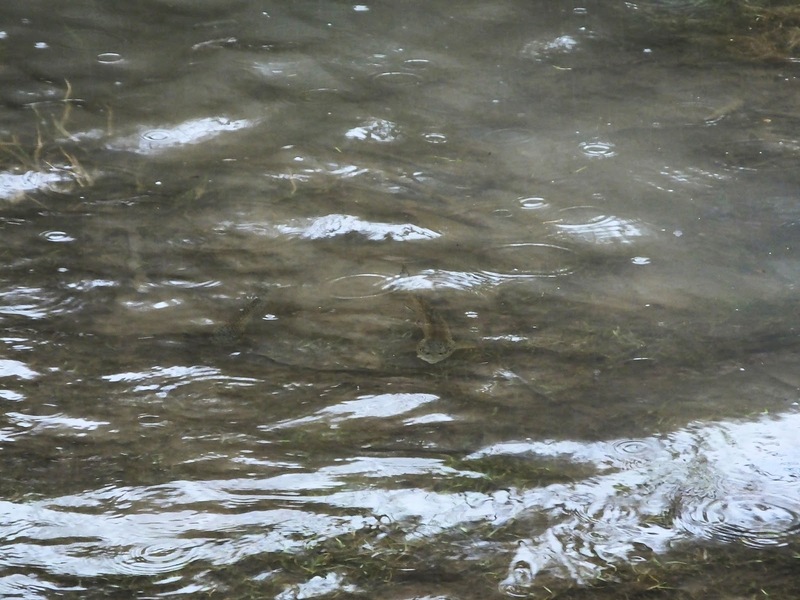 Really high on the list of hallowed waters are the limestone streams around State College, Pennsylvania. 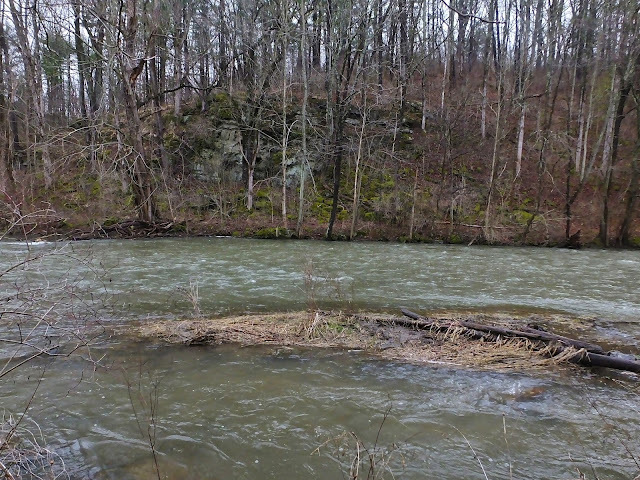 The largest and most famous of which being Spring Creek. Spring Creek, aside from having the most robust wild brown trout population in PA, is an important part of American fly fishing history. Theodore Gordon wrote about brook trout and then wild brown trout near Bellefonte in the 1870's. Joe Humphreys perfected his craft in the watershed. George Harvey started the first college angling course at Penn State in the 1930's. Spring Creek has suffered at the hand of man but ironically cam out of it a more wild fishery. The great green drake hatches of the past disappeared in the 50's after sewage and chemical spills. 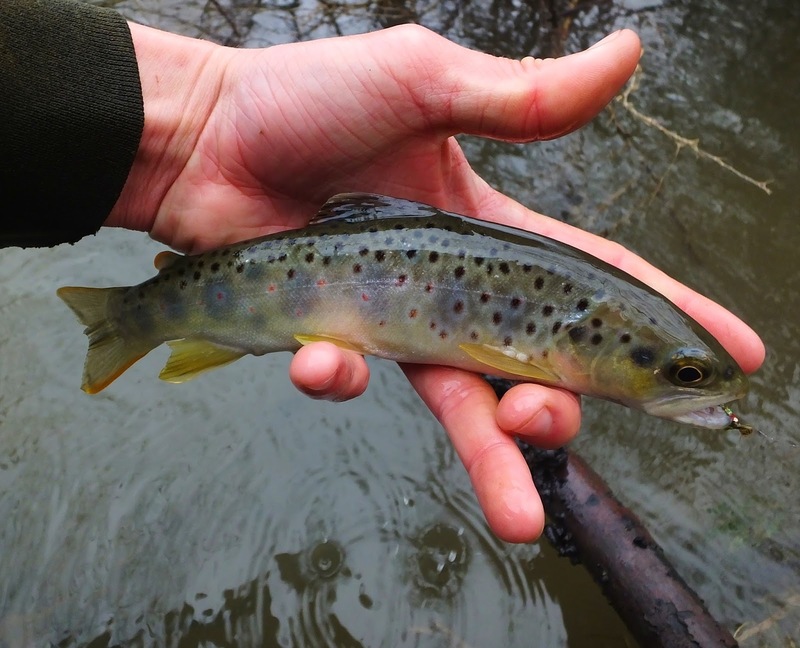 The same contamination lead to the end of stocking and a start to no-kill management, and from there an entirely wild trout fishery was born. 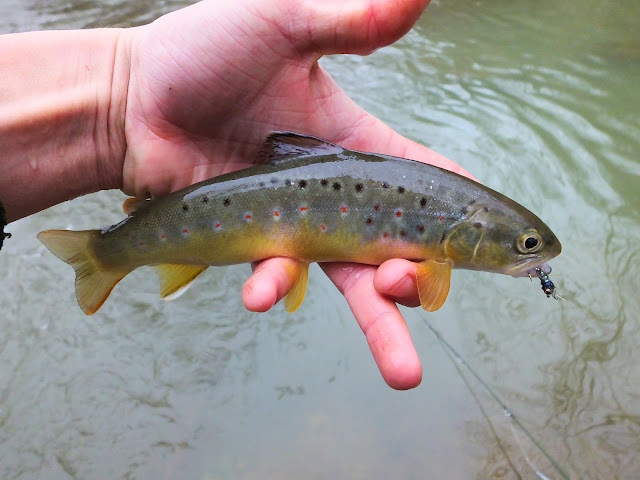 Spring Creek is a place I've wanted to fish since I started fly fishing. 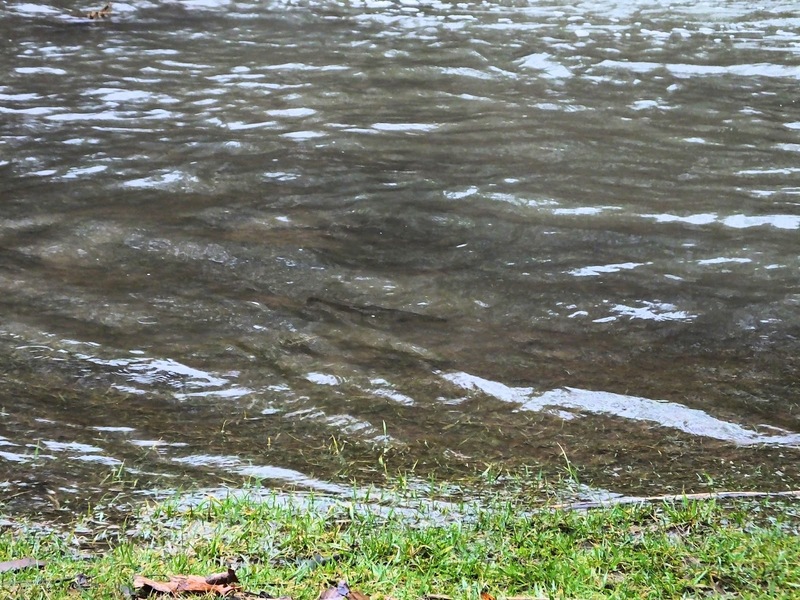 And today, I stood on its banks in a soaking rain, seeing a very high and muddy stream and wondering how Harvey would have approached it. Or if he would have bothered. These were not ideal conditions. But Mike Carl, without whom I would not have been standing by this Central PA limestoner, spotted something in the shallow water creeping over the sod bank. Something that completely turned my mood around. 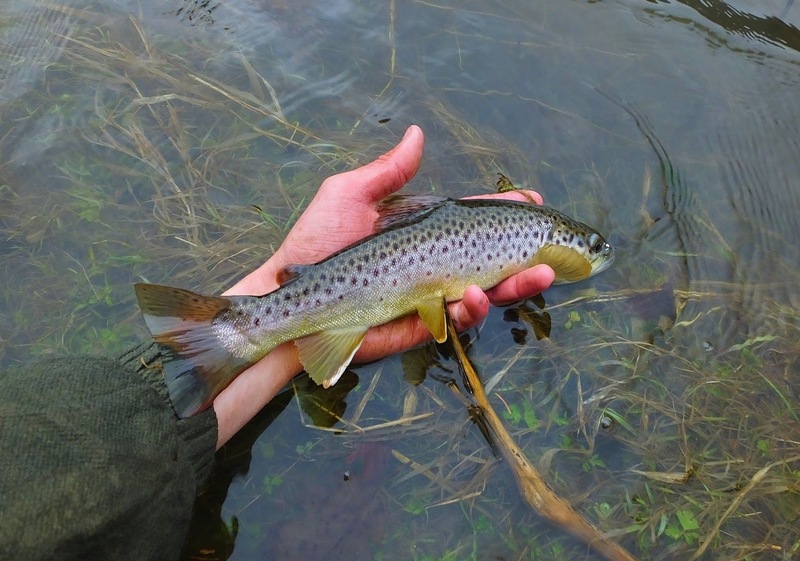 Something extremely uncommon in trout fishing. 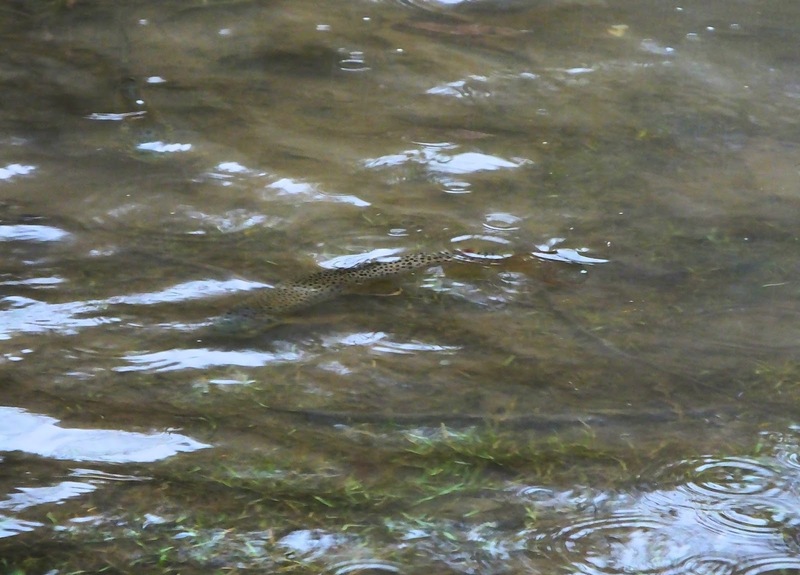 I have seen brown trout tailing like carp a handful of times. but it has always been a lone fish, and it never stuck around long. This time it was a bunch, and they were all over and not going anywhere. The high, muddy water had thrown us a bone, and we made quick work of it. 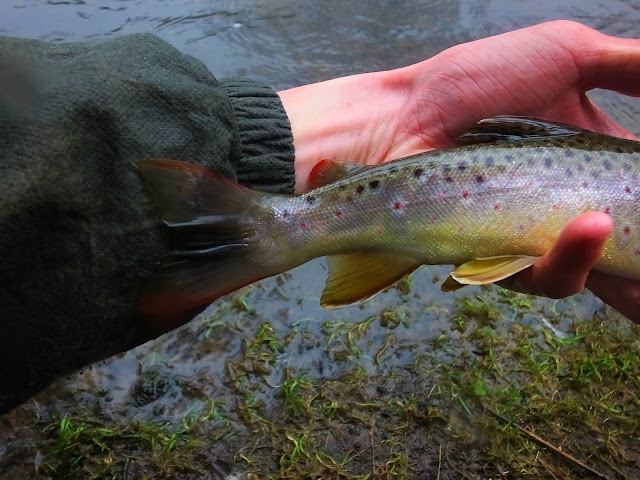 I broke of my first taker, which was especially frustrating as it was quite a good trout for that stretch of water. My next taker did not get away so easily. 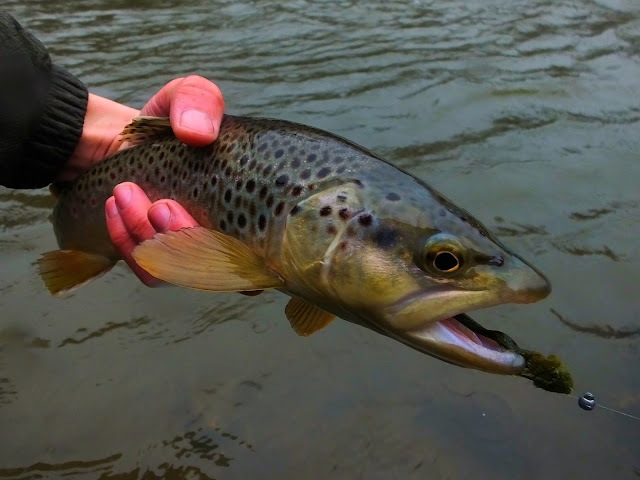 I saw it come out behind a clump of grass in a slow back eddy, dropped my beadless Walt's Worm a foot in front of it, and over she came before the fly even had a chance to sink. Some time later I found another willing customer in almost the same position. It was so close to the bank though that on it's second jump it landed in less than an inch of water. Quick fight, beautiful fish. The last fish I caught in our short hour long opening act was the biggest and also sitting in the hardest water. It gave me the best fight for those two reasons. We're going to be here for a few more days. My hope is that this sight fishing will persist. It is something special when brown trout act like bonefish. A lot of the small brook trout streams I fish are small enough to jump across in places. By all accounts, small water that many would overlook. Some I could cold step across in places. Still others I could step across almost anywhere I feel like without tearing my britches. This is one such small stream that I fished on Monday. 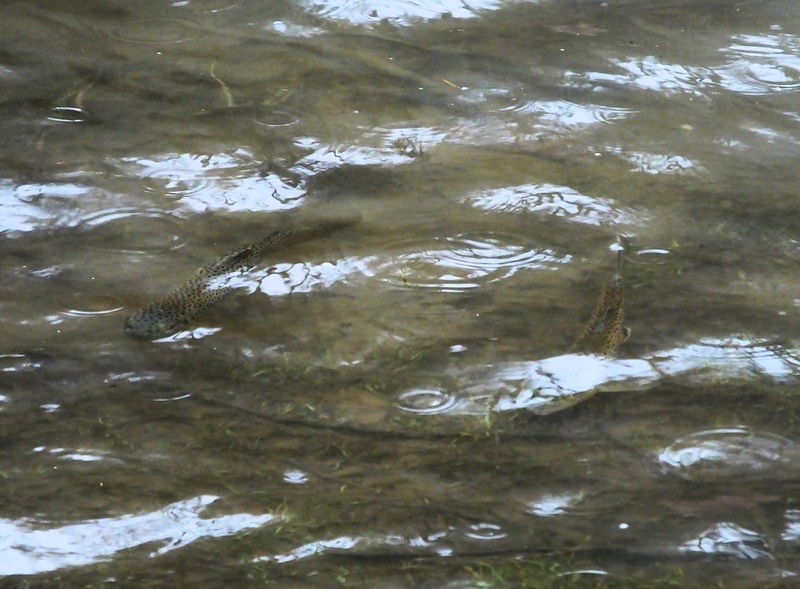 Not all of this tiny seasonal streams is able to hold brook trout. The ones that do nearly always hold populations with growth rates so slow that three inch brook trout are of spawning size. 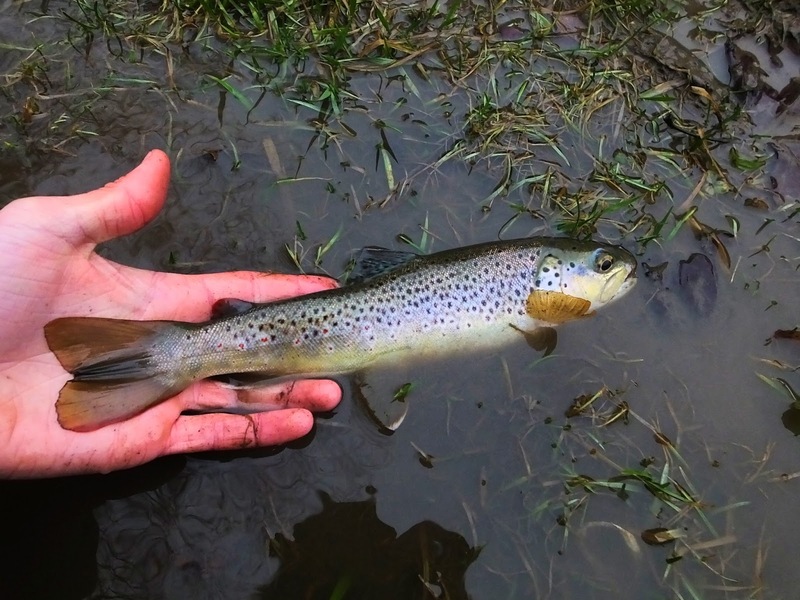 It is extremely rare for these tiny watercourses to hold fish over eight inches long. The beautiful char below is usually a big one in a stream so small you can step across it. 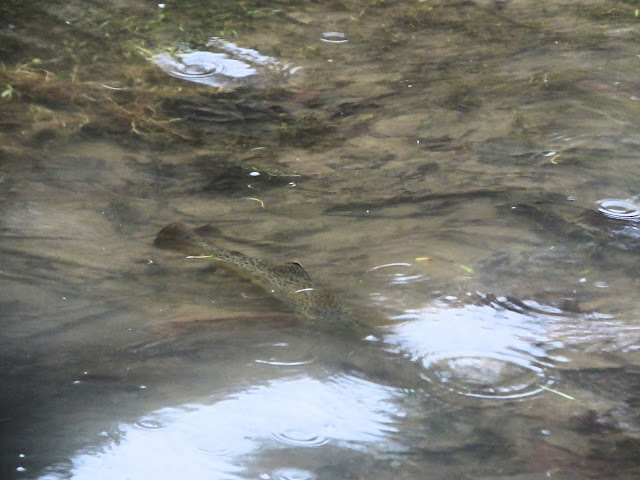 When I hooked the next fish in a pool where two branches of the stream met on my little Crazy Shrimp, it defied a lot of the rules about how big brook trout should be that can survive in a brook of this size. I'm used to having fish here fly past me when I set the hook, this one actually took line. 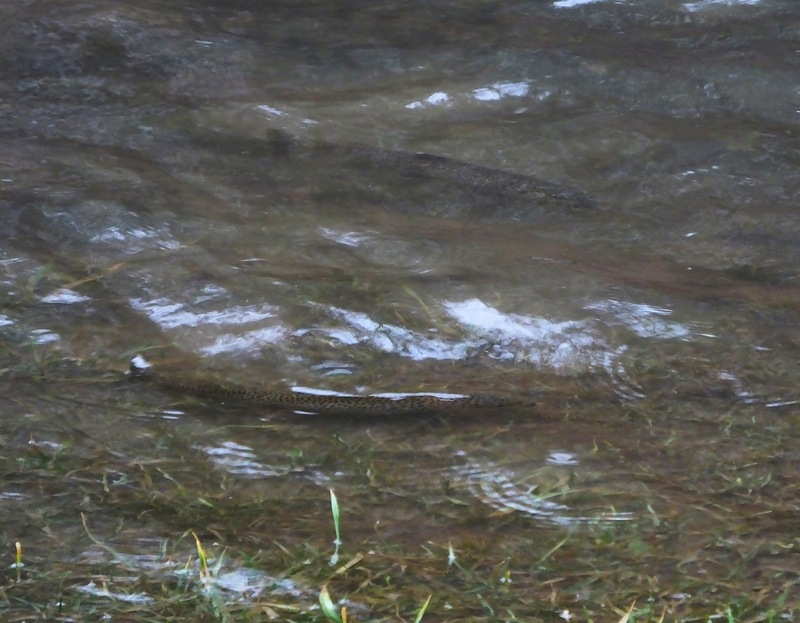 It's not common that I get to encounter one of the oldest and biggest fish in a stream. Every time I do I am not so much excited as mind blown. Sometimes it calls for a short reflection break on a fallen log or boulder, followed by no more fishing for the rest of the outing. Not on the same stream. 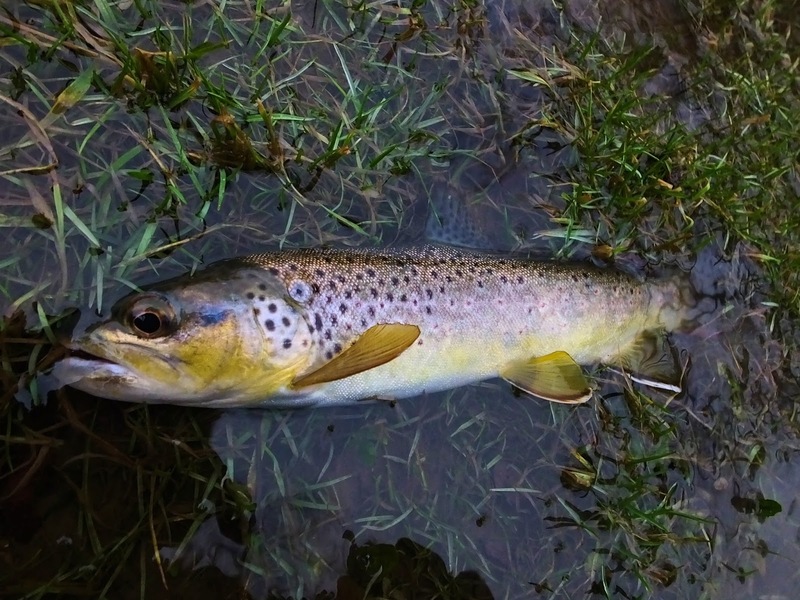 When a stream gives up it's most spectacular resident , what more do you need from it?